Design Thinking. Specific definitions vary and they all include a problem solving process that puts identifying people’s needs first using a variety of tools to achieve results. This is my favourite part. Getting the results. Too often in our industry of software and services we consider that an individual transaction is the end of an association. It shouldn’t be. Digital solutions are not one-off billboards. Iterations, experiments, observations, insights, and action drive real change and create valuable products. Despite growing in popularity as a process, not every agency nor every client is sure how it can be made to work for them. Chew on these great examples to get inspired. They work for me! 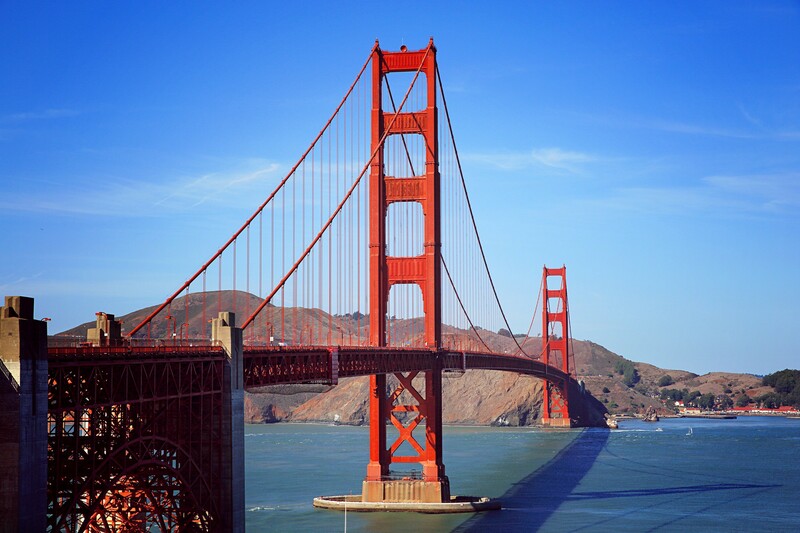 Services and financial support for people living with disabilities in the San Francisco Area can be found through the Golden Gate Regional Center. Travel, assessments, home visits, evaluations by medical professionals, and months of waiting are just some of the challenges faced by parents of children depending on assistance. Two Stanford students, Elizabeth Woodson and Saul Gurdus wanted to try something new. “We must meet families where they are, both physically and emotionally.” The resulting prototypes were “open houses,” held right in the communities where eligible families live. They ran an experiment and brought the Golden Gate Regional Center to the people. Packed in a Winnebago, staff met potential clients in the neighbourhoods that they live in. The day of the experiment they did nine assessments in less than two hours. Processing the assessments took a concentrated week of work — 10 weeks faster than usual. The Winnebago experiment opened all stakeholders’ eyes to the possibilities of prototyping new solutions that might improve processes both for internal staff and the people they serve. Insight: Experimentation, theory, testing and refinement can lead to deep organizational change and better service delivery. 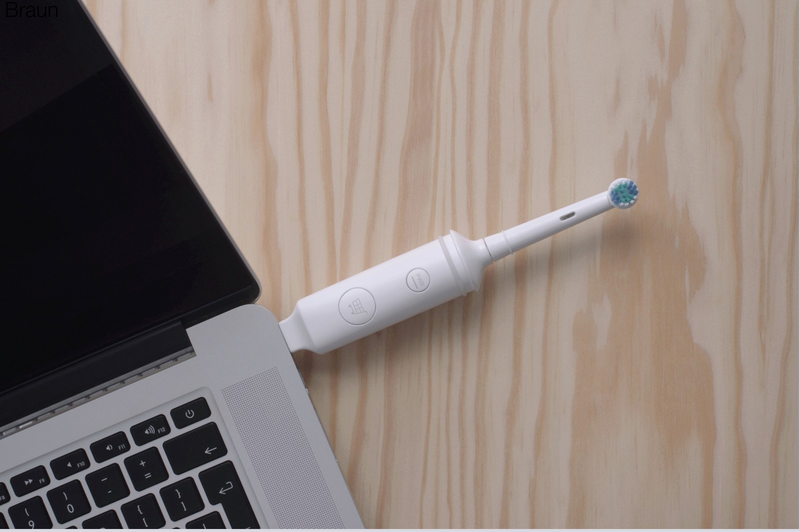 When tasked with creating a smarter electric toothbrush, Kim Colin and Sam Hecht were presented with client ideas that included playing music and tracking users’ brushing performance. Instead, they chose two key issues identified by users and made those the value-added features for the product. Charging the device and ordering replacement brushes. This project shows how designers can go beyond just serving briefs to bring opportunity by having empathy for people using the end product. Had this team just taken direction and spit out a tool that met the brief, their client would have a lifeless product that customers didn’t value. Instead they focused on core frustrations and used available technology to solve those frustrations in a seamless experience. Insight: Focusing on specific features that people actually need produced a better product. In his 2013 presentation to The Conference in Malmo Sweden, Golden Krishna offered us a simple philosophy for how to approach the application of technology to solving problems for people. “The best interface is no interface.” Elsewhere you can find a similar idea described as Zero UI. Or in more pretentious circles you might find it described as “common sense”. In a scenario where a person, any person really, lets say… Mitt Romney (? ), walks with full hands to his vehicle. As his hands are full he is unable to easily open the hatch door. What to do? Perhaps, if the car is already unlocked, he could hold his precious cargo, tempt gravity, with a swipe of his foot under a sensor the door could then open. This is a spectacularly simple idea that for a number of people could be helpful. And no interface required! 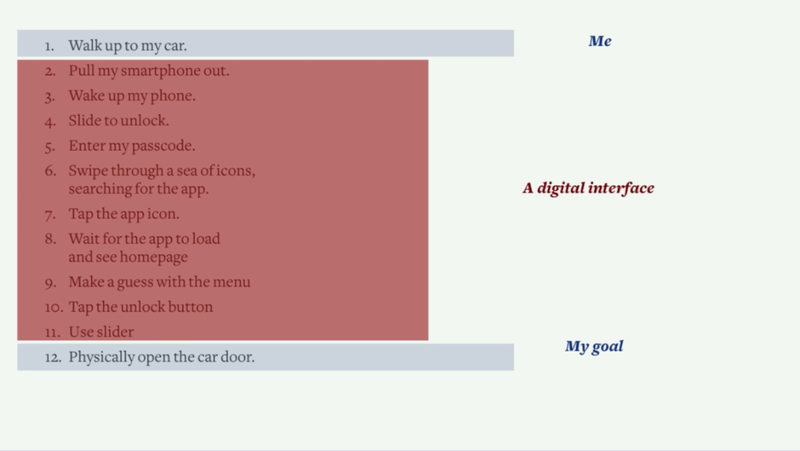 The concept of No/Zero/Less UI suggests we stop trying to throw Graphical User Interfaces at every problem. A great philosophy, though we know our mobile “phones” will continue to be a source of identification validation and control for IoT devices and much more for years to come. Until Kurzweil’s predictions about nanobots in our bodies that are connected to the internet are realized, mobile devices and the interfaces they employ will continue to be useful. Insight: Experience design matters. Removing unnecessary steps in our interfaces and sometimes the interfaces altogether can create better solutions for people. …And one more makes four. Because they’re great. Perhaps the best case studies I’ve yet to come across are included in the book Solving Problems With Design Thinking, 10 Stories of What Works. Number six of ten, Redesigning the Customer Contact Center at Toyota is notable for the sheer scale of change. The challenge for Gayle Darby (University of Toyota) and Diane Jacobsen (Hitachi Consulting) was significant. Vehicles from three major brands Toyota, Lexus, and Scion were all experiencing the same issues with call center support. Customer satisfaction was down and wait times averaged 20–40 mins. And that was just to get someone on the line. To find answers service reps were using as many as 13 different applications, would have to speak to internal tech support, walk to filing cabinets for hard copy information or ask one of their more experienced peers. Certainly a better software tool with a unified source of relevant information could speed things up. More than that a change of internal process was required. Having learned from past experiences, Darby knew that change on this scale wouldn’t be easy. All stakeholders would need to participate from the beginning. From software engineers, to business execs, to the reps themselves. The service reps were specifically asked what their primary frustrations were and what they needed to do their jobs. Because they were participants in the development of solutions they had ownership over its success. Their investment also came from seeing immediately the benefits of proposed changes. With new training, internal processes, and better software tools reps were able to solve customer’s problems with an average of two fewer calls, faster response times, and millions of dollars saved by empowering reps to answer more questions faster. The project became a model for problem solving and change-management within the entire organization. It is strange to me as I sit here writing how often we as designers still need to make “the business case” for design. When so many examples are out there from which to draw insight and inspiration. When VC firms are adding design partners. When design firm acquisitions are on the rise (50% of all acquisitions since 2004 took place last year). Client education and selling our value has always been a part of the design service tool kit. To make this easier industry-wide maybe we should empathize with people’s needs, observe them in action, collaborate, come up with working theories, test them, track results over time, and refine, and then refine again. That’s a case study I would love to read. Design & Technology Strategist. Transmitter Studios Inc.